This Wednesday, April 17th, you can join composers Bruce Broughton, Joel McNeely, John Debney, and Andrew Cottee, together with Seth MacFarlane, star/creator of FOX hit TV show The Orville, for an in-person discussion and Q&A about its incredible music, moderated by Jeff Bond. 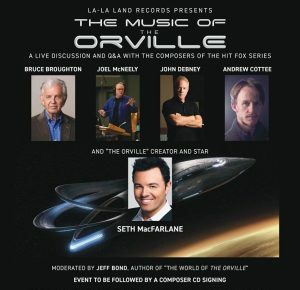 To attend this event, organized by La-La Land Records, you will need to reserve a free ticket. If you want to get a CD signed by the composers, ticket will cost $ 22 (19 €) (CD included in the price). NO additional items will be allowed for autographs.